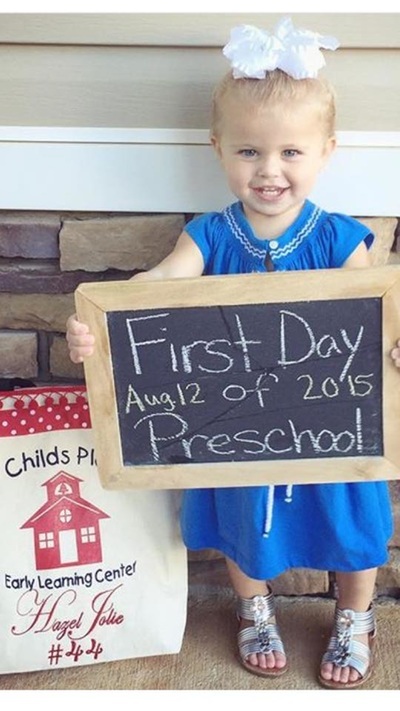 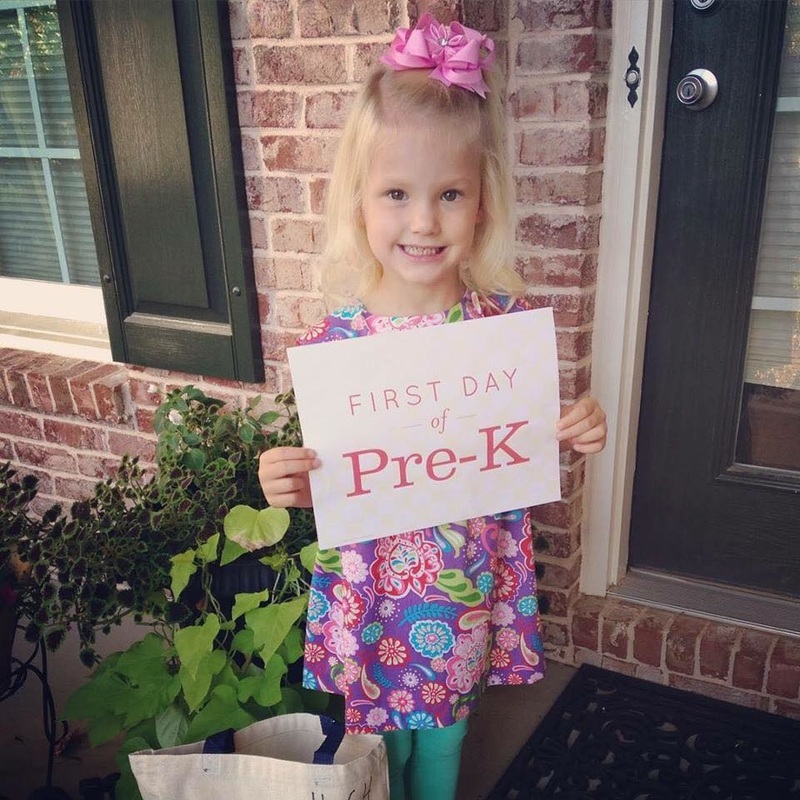 We love to see and share your 1st Day of School pictures! 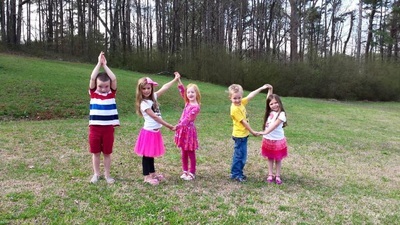 Tag Child's Play in your Facebook posts! 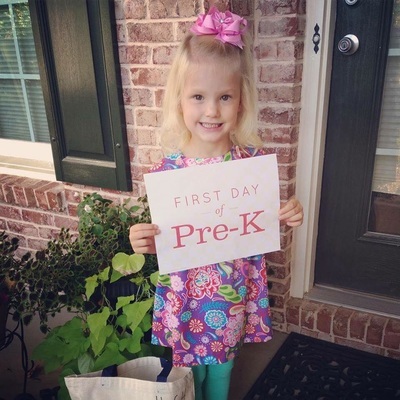 The 1st Day of School is always so exciting! 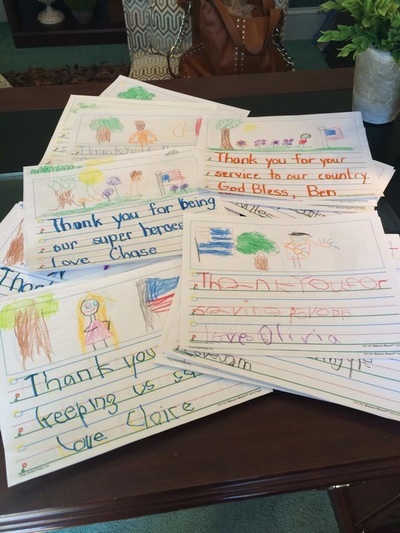 Every October our 4 year olds participate in Bert's Big Thank You. The children send hand written letters to soldiers overseas to show their appreciation! 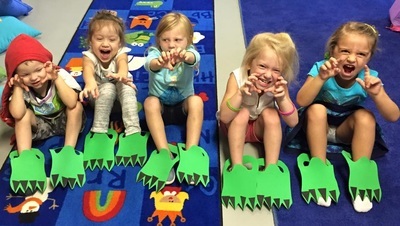 Look at these cuties having fun with the letter of the week. 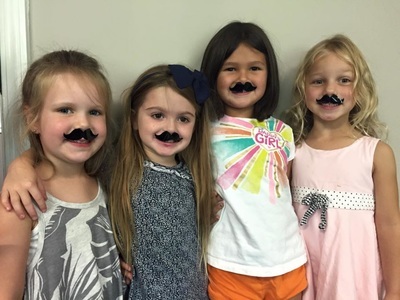 Mm is for mustache! 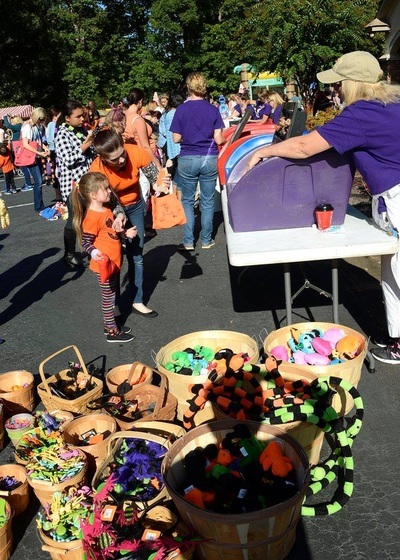 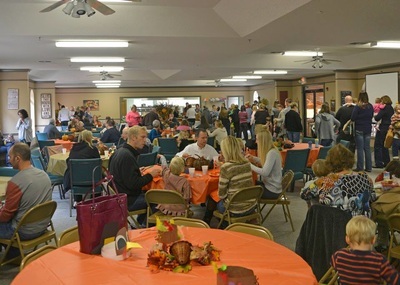 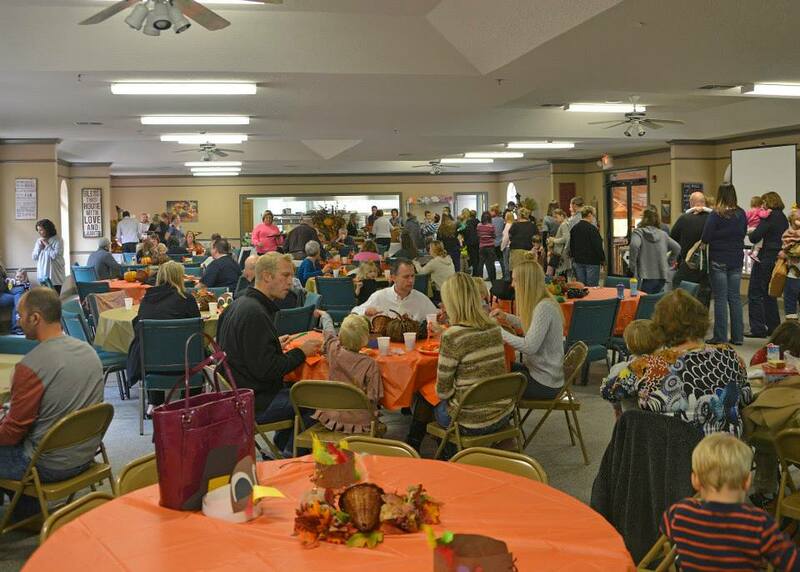 Our annual Fall Festival is always a big hit! Fun face painting and crazy hair at our Fall Festival. Evie is having such a fun time at the Fall Festival! 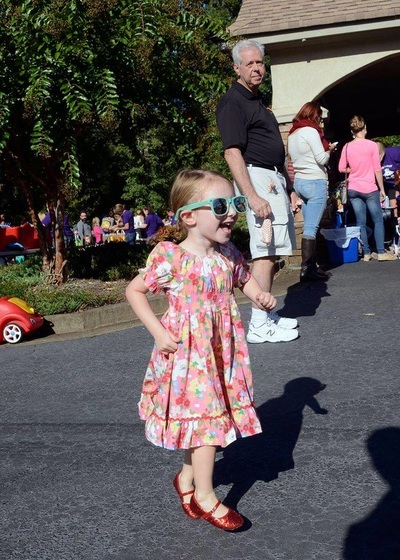 She is strutting her stuff! 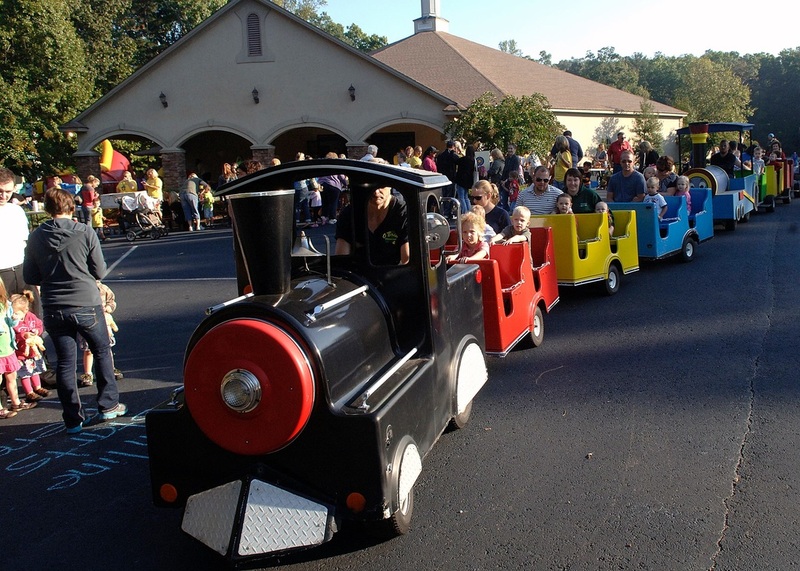 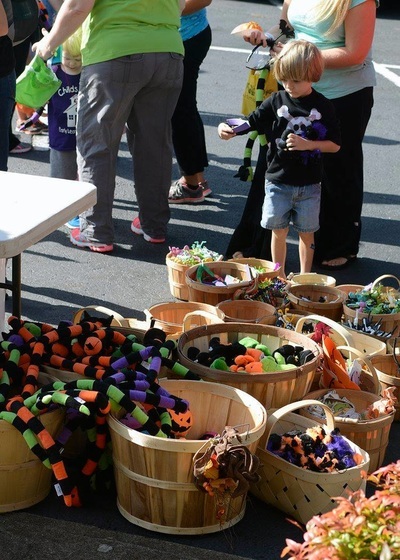 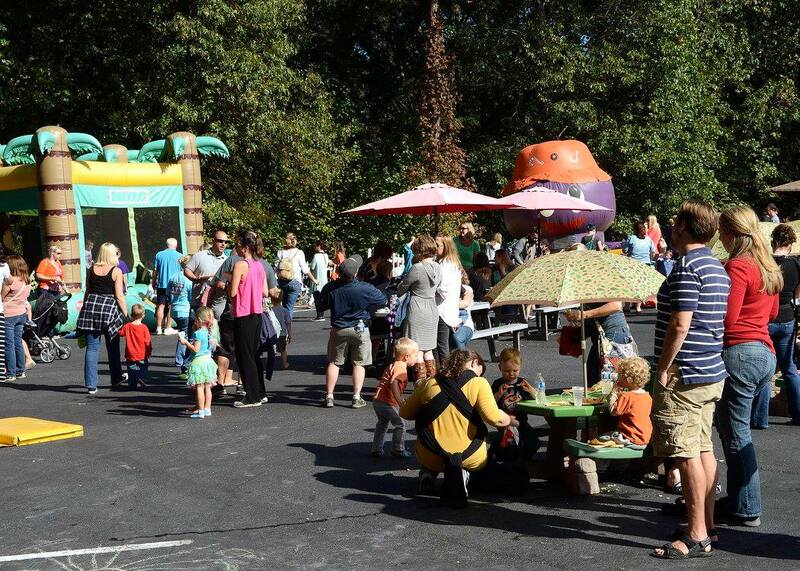 At the Fall Festival we have 5 inflatables, 2 trains, game booths, and so much more! 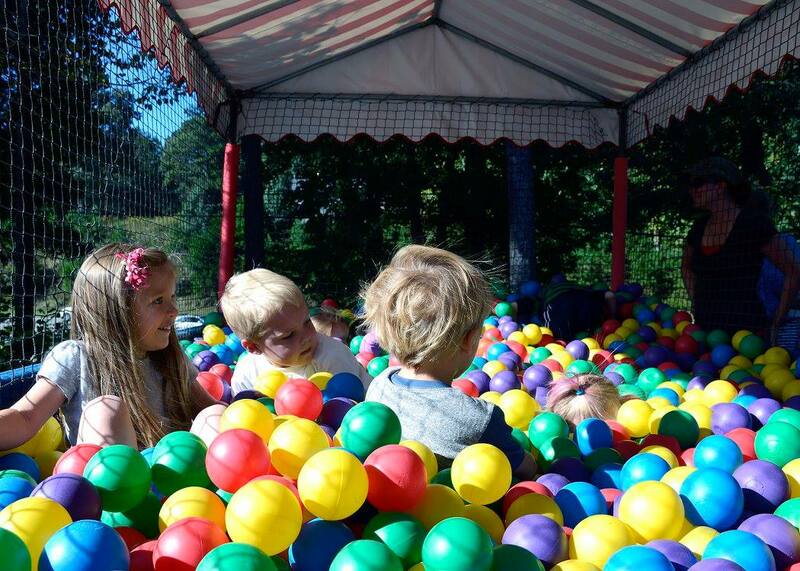 The ball pit is such a blast! 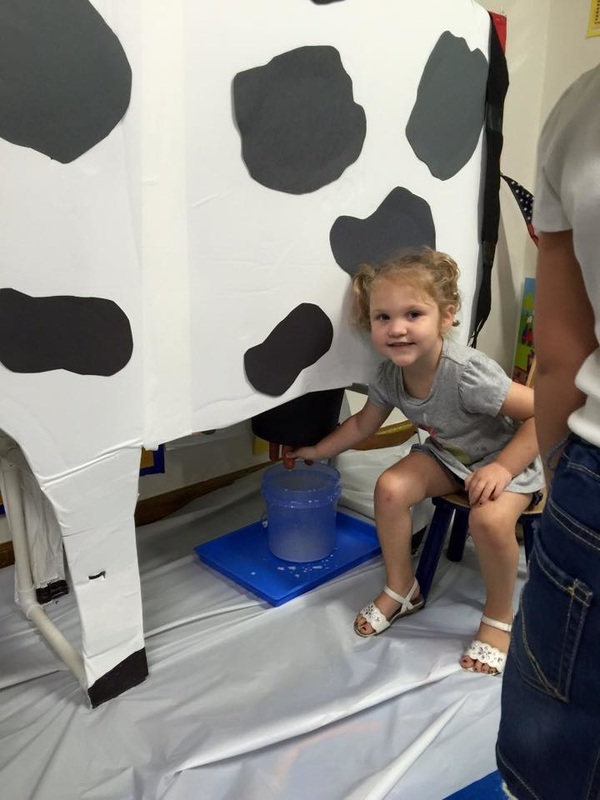 Emmy is working hard to win some awesome prizes at the Fall Festival! 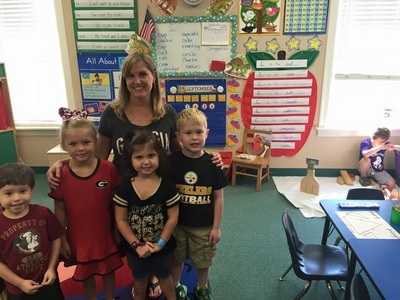 Support your favorite football team by showing their colors on Football Friday this fall. 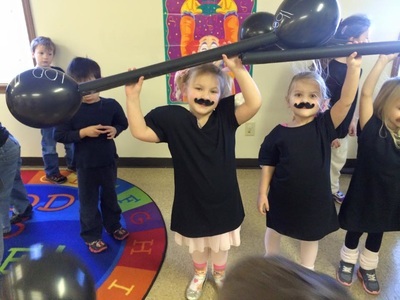 During our Circus theme the kids had to much fun "performing" their favorite acts! These are the strongest "muscle men" in Cherokee County! 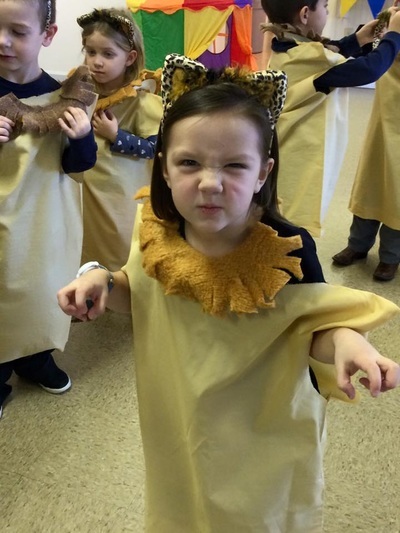 Watch out for this ferocious lion! 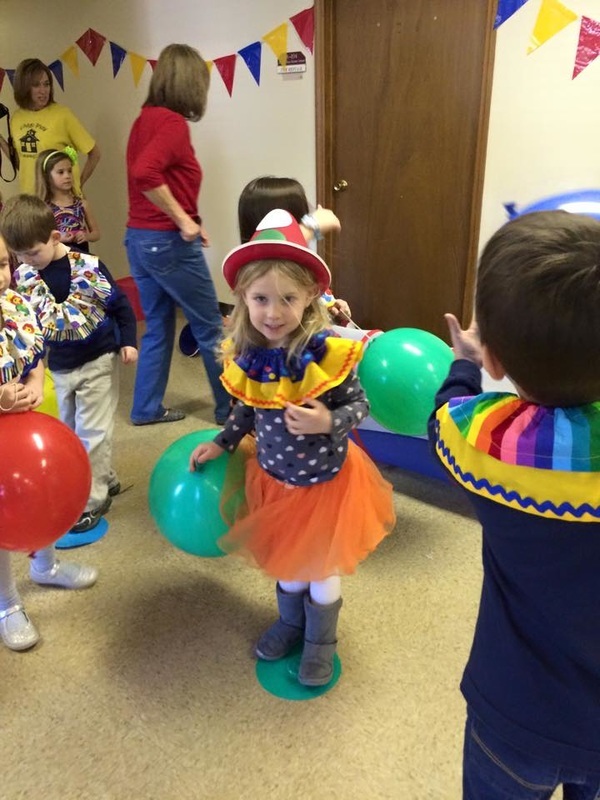 She's the most dangerous Circus act. 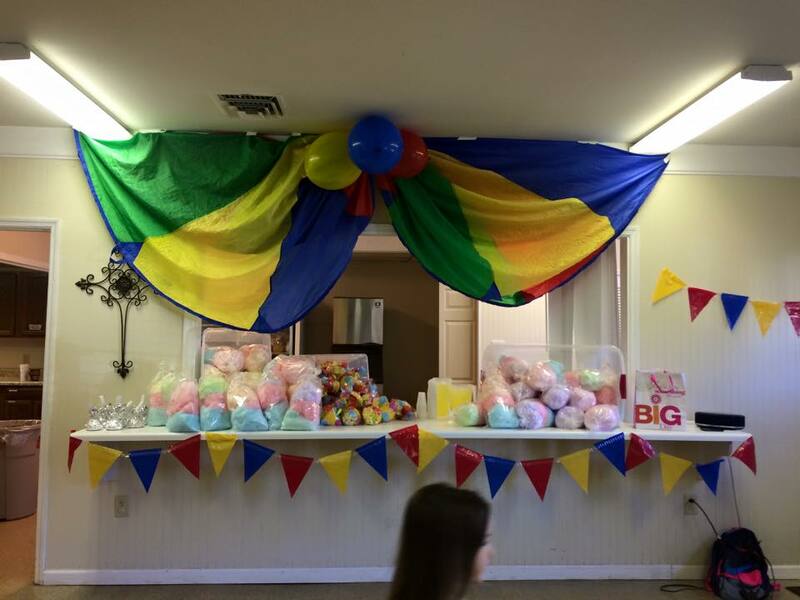 Cotton Candy and Popcorn under the big top! 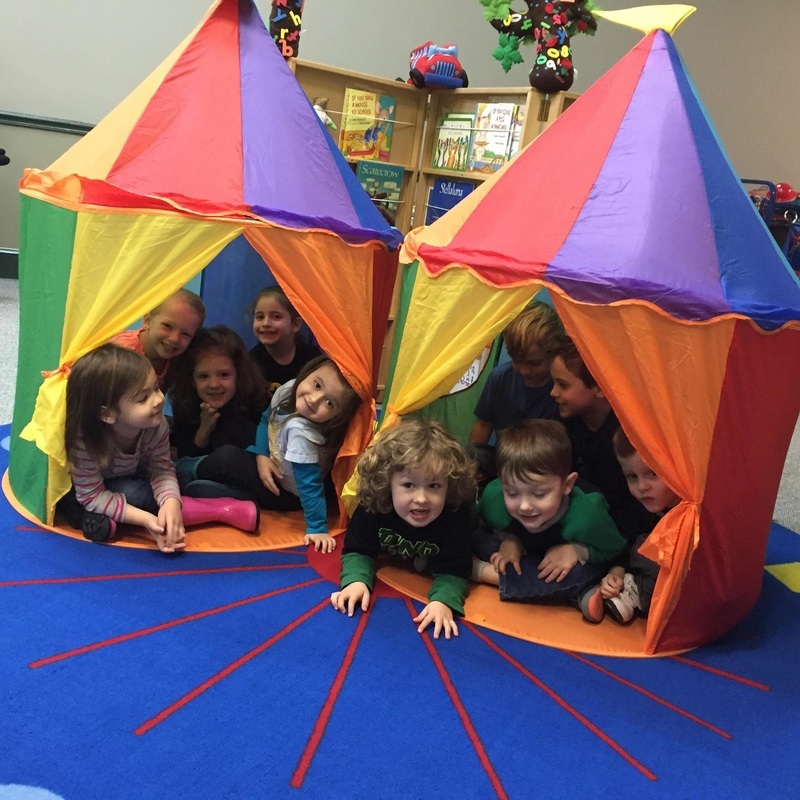 Ms. Lynn's class is having a blast in our "big top tents!" 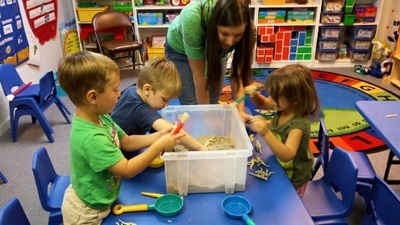 Child's Play promotes counting and math skills with the Child's Play Counting Clubs. Congratulations on joining all 5 Counting Clubs! 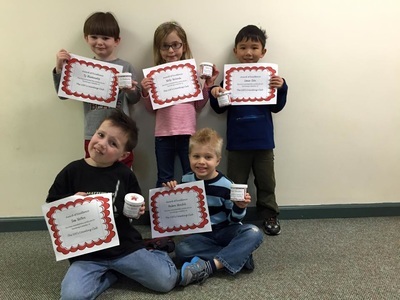 These 5 cuties deserve a round of applause for being the first students to join all 5 Counting Clubs! Our Dynamic Dinosaurs theme ended with a Dino Day celebration! 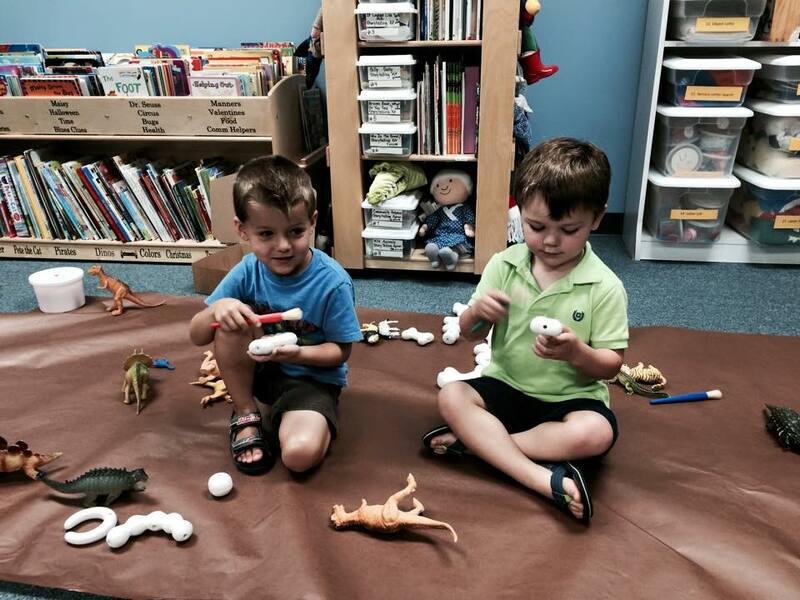 Check out Ms. Heather's friends busy on their archeological dig! These students have recreated a dinosaur skeleton. 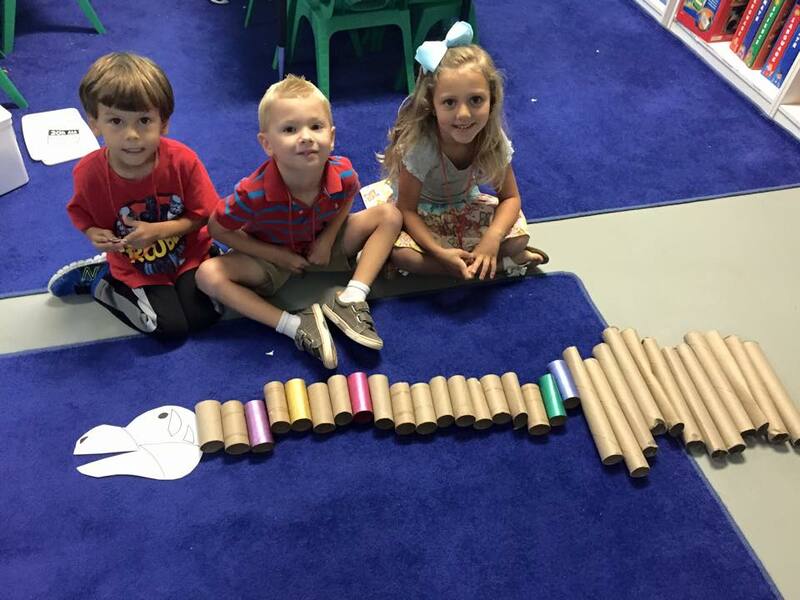 They sure are creative! Brushing away the sand and dirt from these dinosaur fossils. 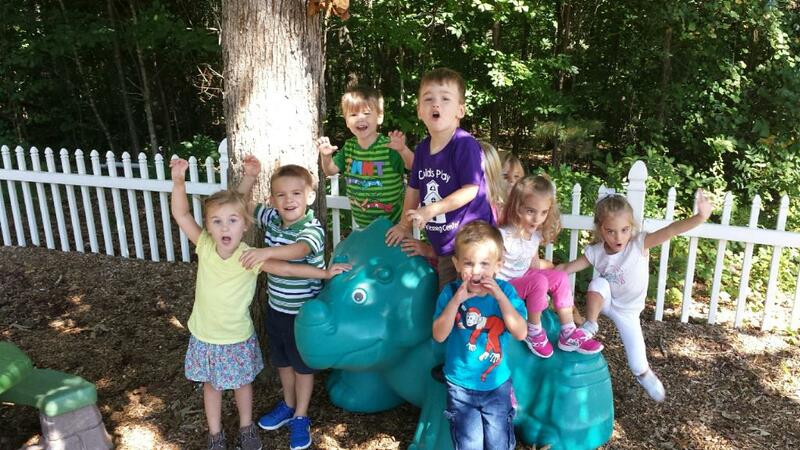 Ms. Andi's class is having so much fun on the playground with our dinosaurs. 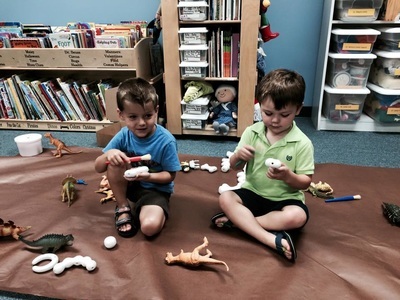 Look at our future paleontologists! Hear me ROAR! 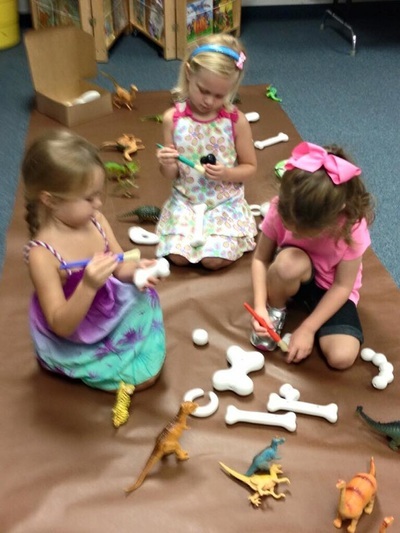 Dino Day was so much fun! 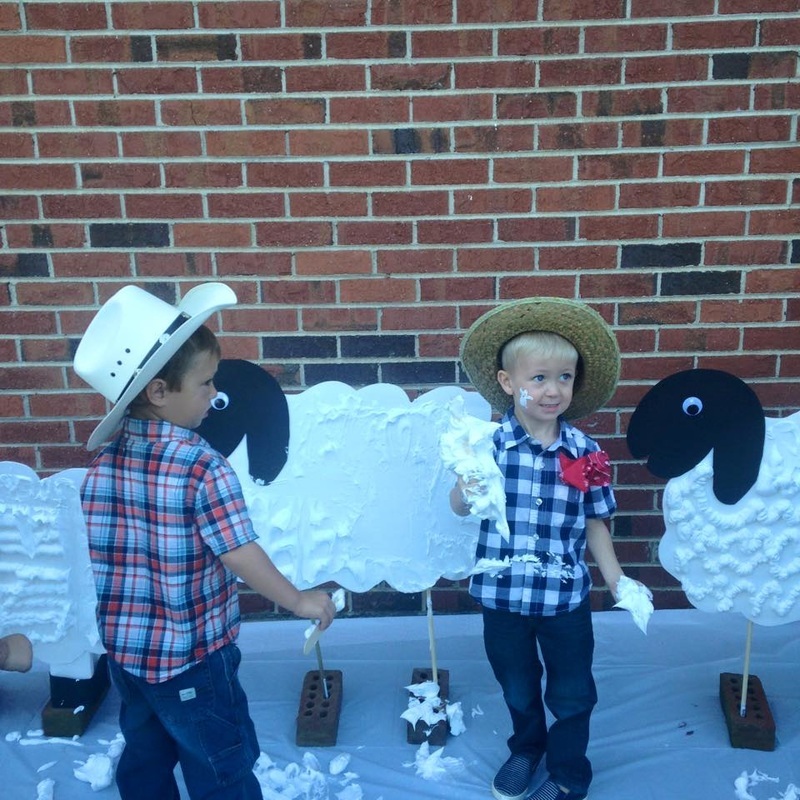 During our Down on Grandpa's Farm theme we learned how to shear sheep. 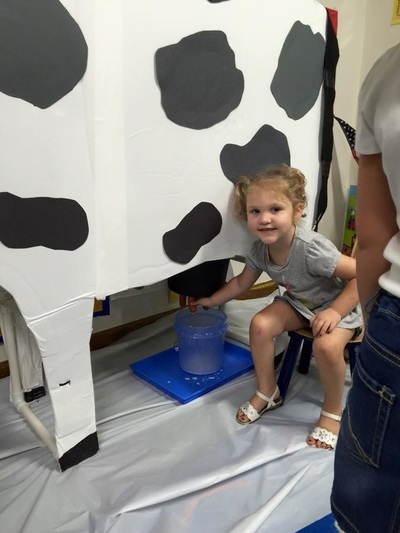 When we studied our Down on Grandpa's Farm theme we discovered how to milk "Ole Bessie." 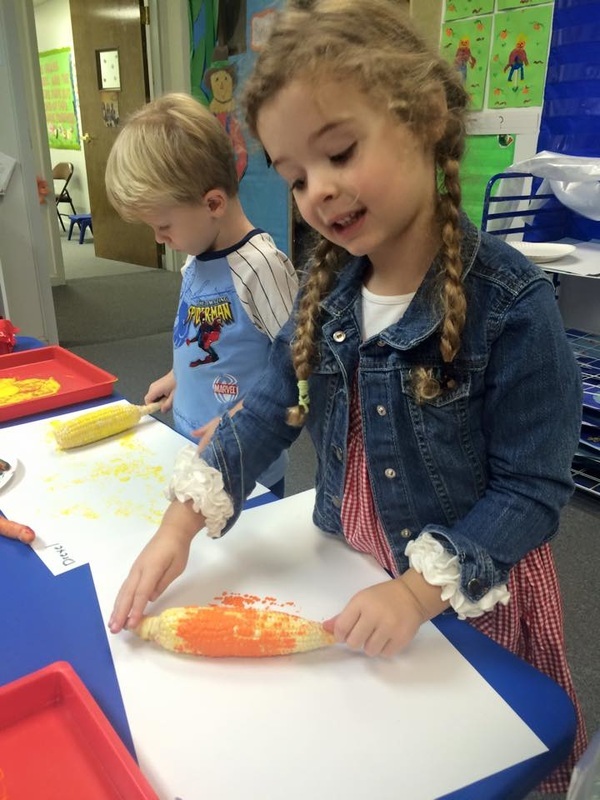 After shucking corn our students painted with vegetables. 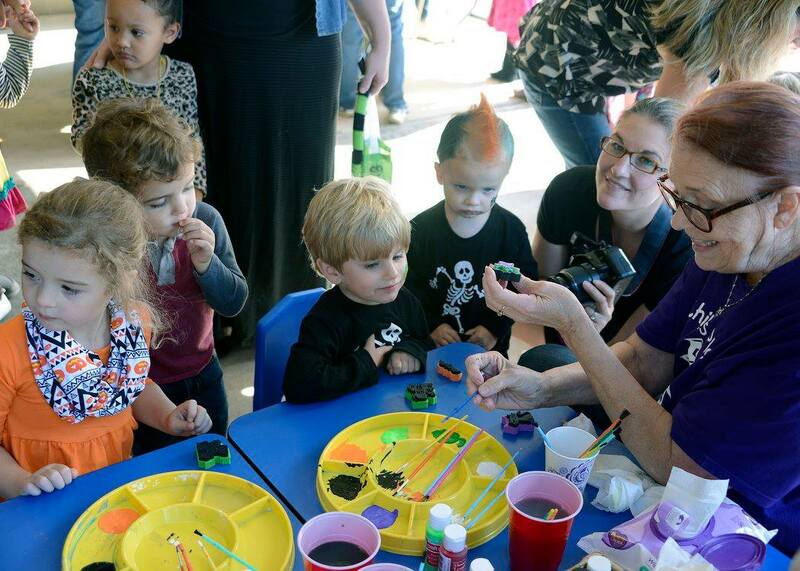 Community outreach is such an important part of our curriculum. 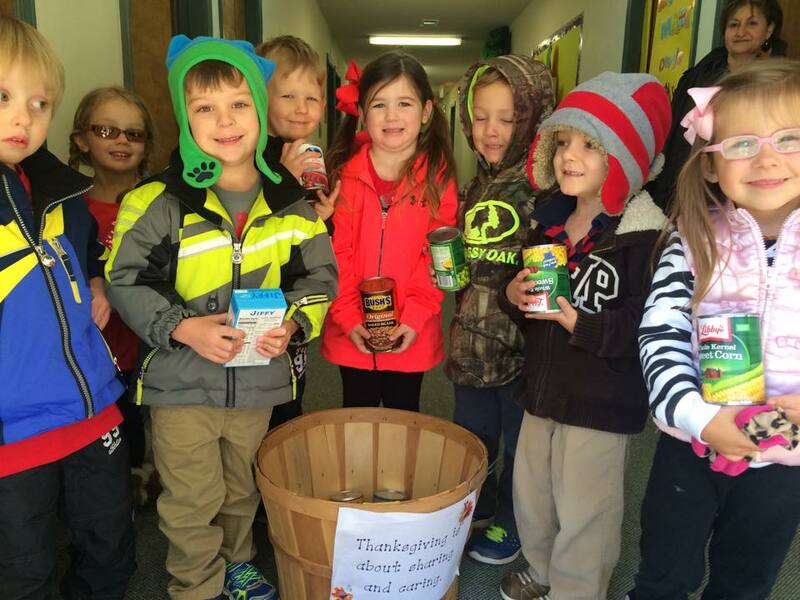 Ms. Bea's class added so many food items to our donation bins! These pilgrims are getting ready for our Thanksgiving Feast and Sing-A-Long. 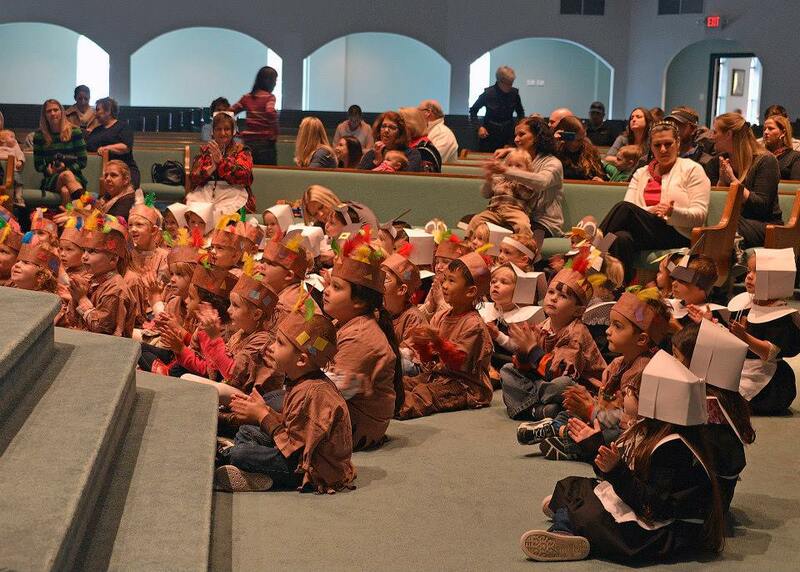 Turkeys, Pilgrims and Indians all enjoying Mr. Geoff during out Thanksgiving Feast! Madison worked up an appetite and is ready to feast! 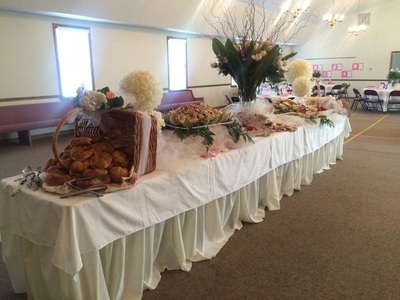 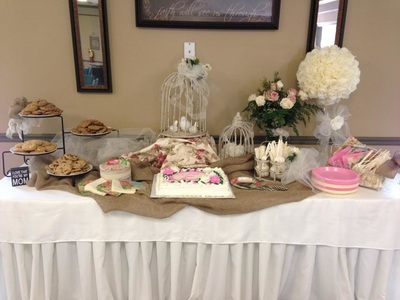 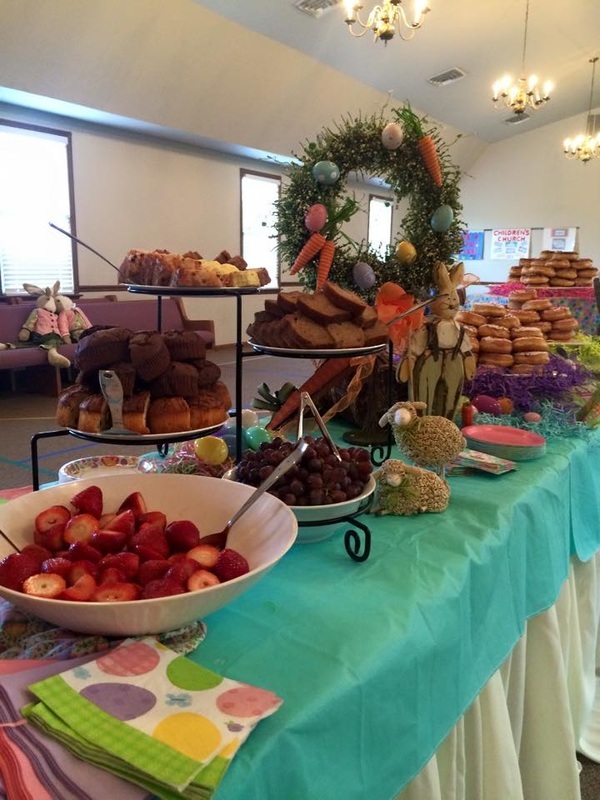 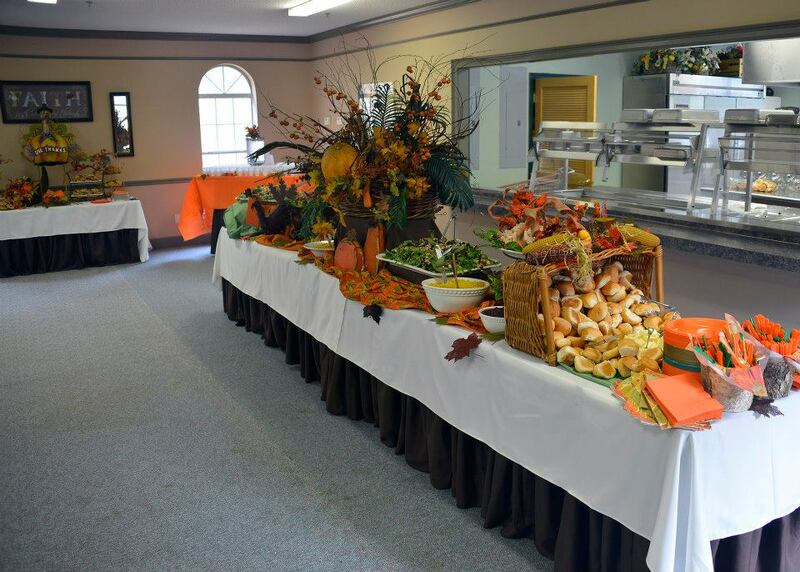 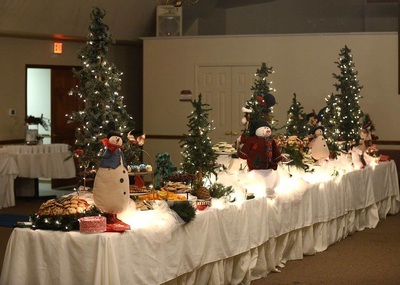 Ms. Donna, Director and Owner, outdoes herself every year! What a beautiful setting for a special lunch with Mom and Dad. 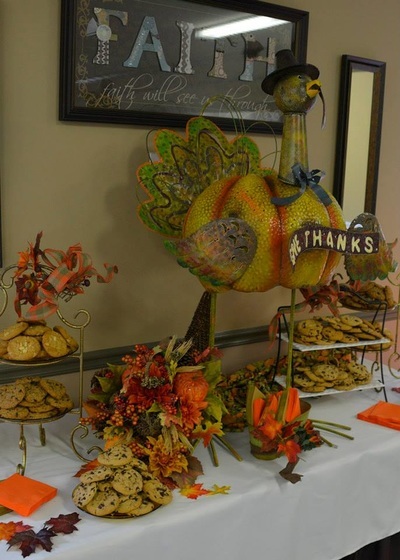 Along with delicious turkey we cannot forget the cookies and pumpkin pie! 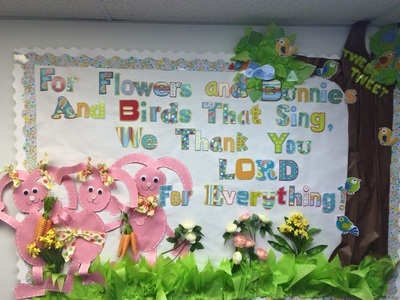 Child's Play is so fortunate to have such involved parents! 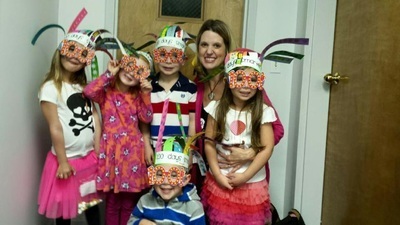 We love seeing families enjoy quality time together. 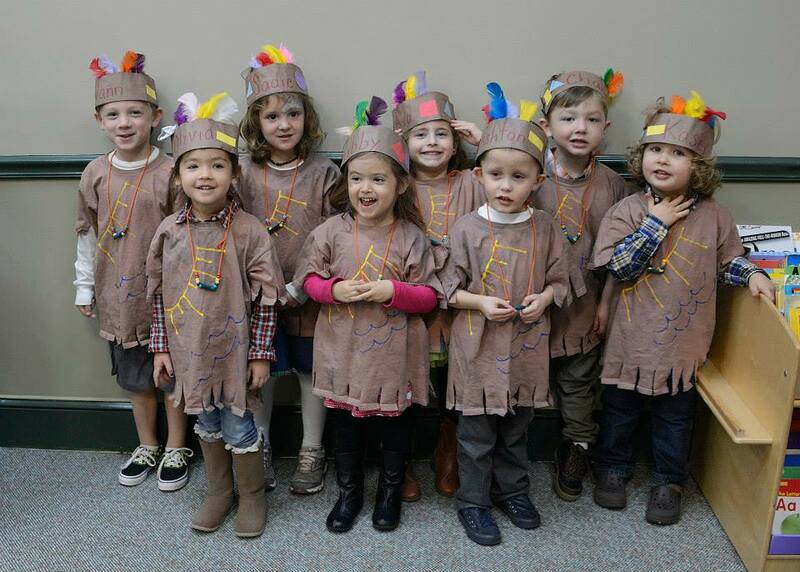 These Indians have been singing their hearts out! 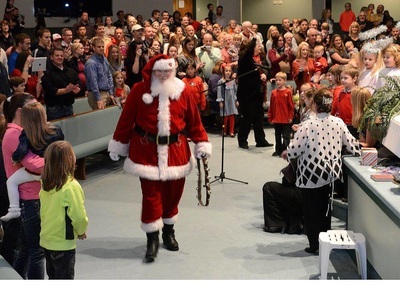 I hope you're ready to hear a few new tunes at home. 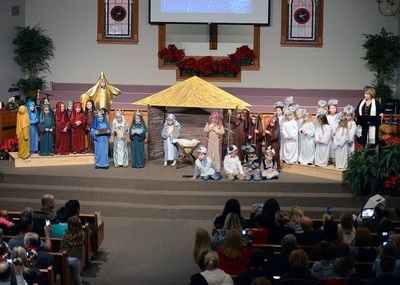 Our 4 year olds perfected the Nativity Scene during our Holiday Performance! Our students work hard for weeks learning Holiday songs! 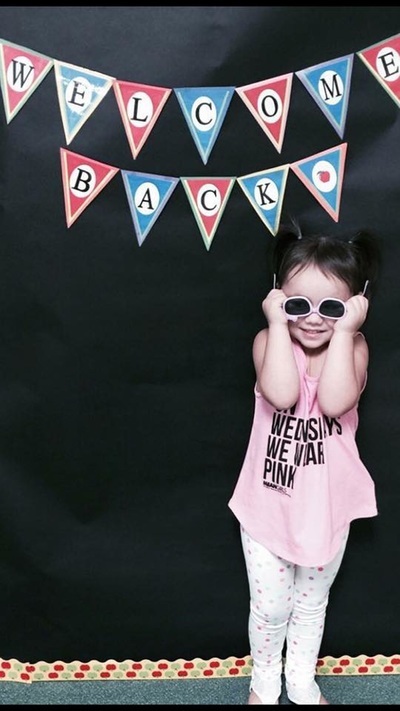 It's music to our ears! The students sang so loud Santa heard them in the North Pole and came to visit! 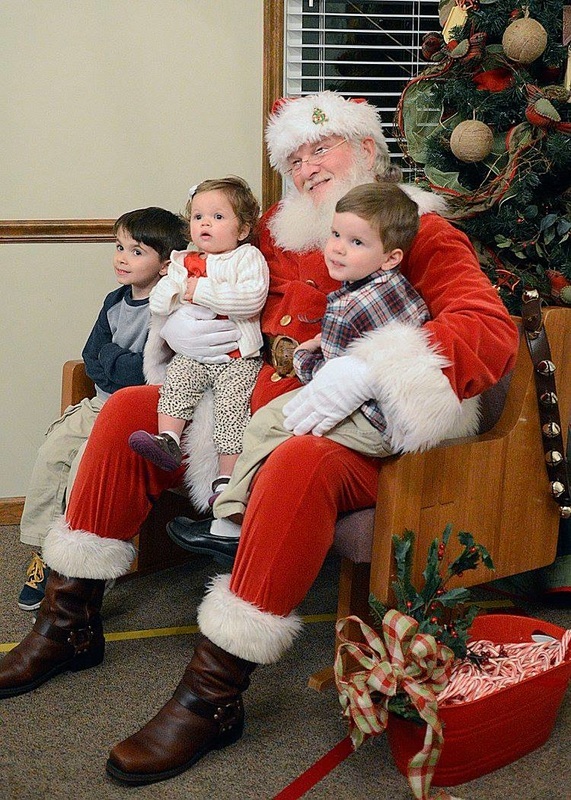 After our Holiday performance families are welcomed in for dessert and juice with Santa. Another breathe taking event from our very own Ms. Donna! 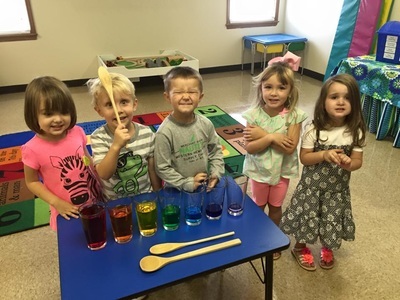 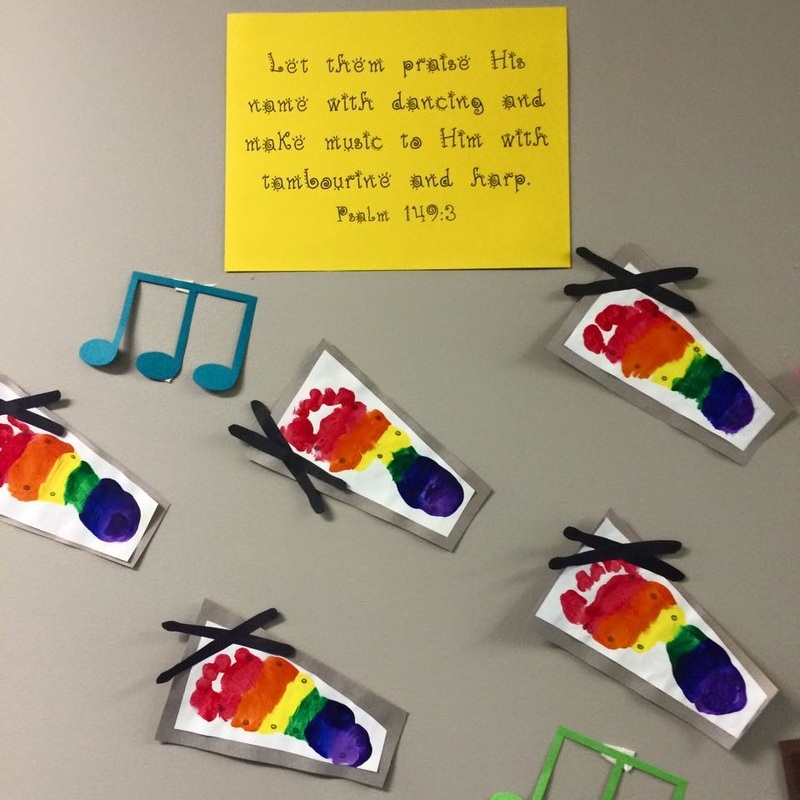 Ms. Connie made Xylophone footprints during our Magical Music theme. Breakfast with the Easter Bunny is a fun morning with your child! After yummy bagels, fruit and doughnuts the Easter Bunny sets us off on an Easter Egg Hunt! 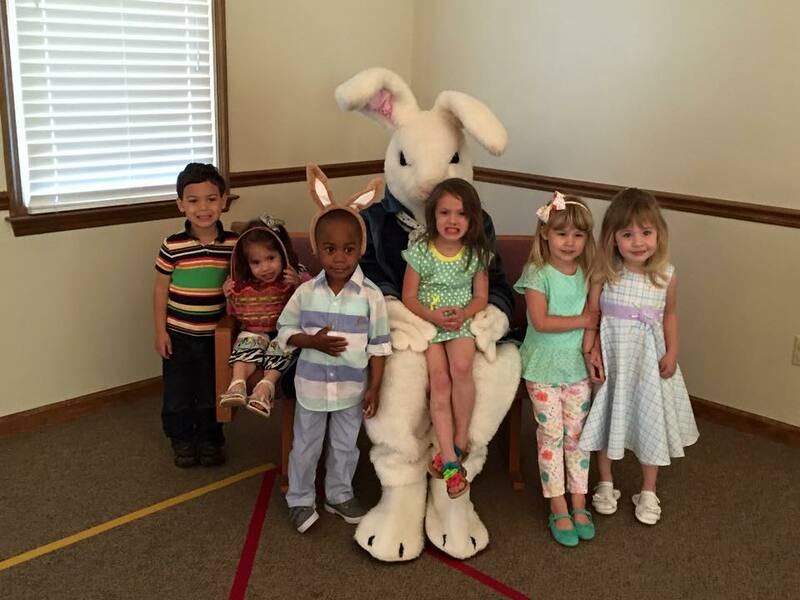 We love to take pictures when the Easter Bunny is in town! Celebrating the 100th Day of School with a quick picture before all the fun activities began. 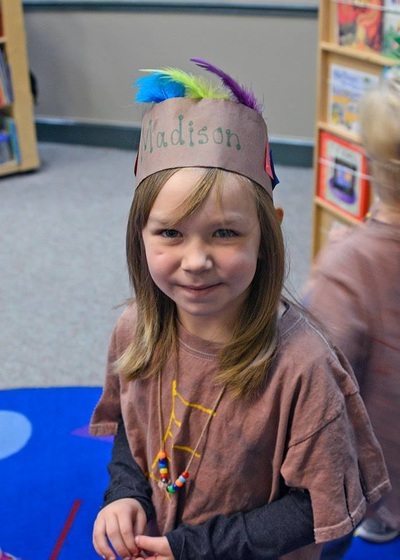 Hundred Day hats, glasses, necklaces and so much more as we count our days of school! 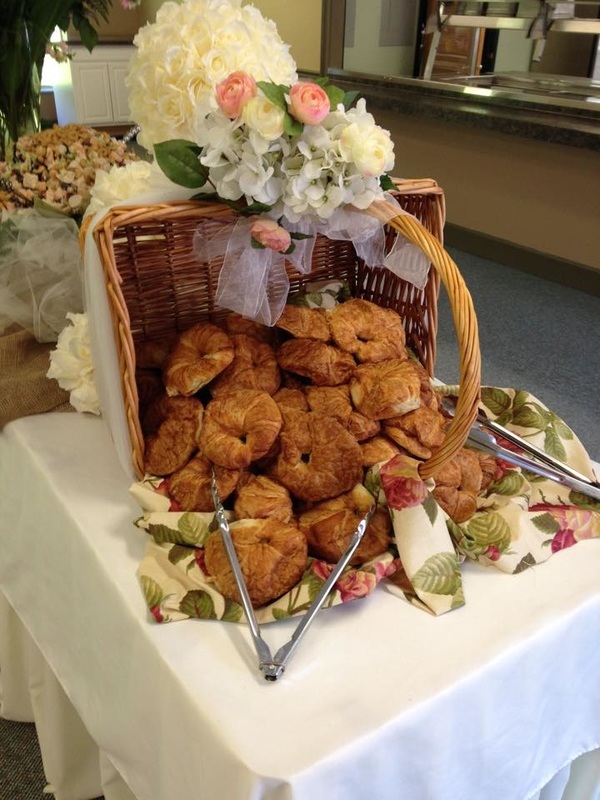 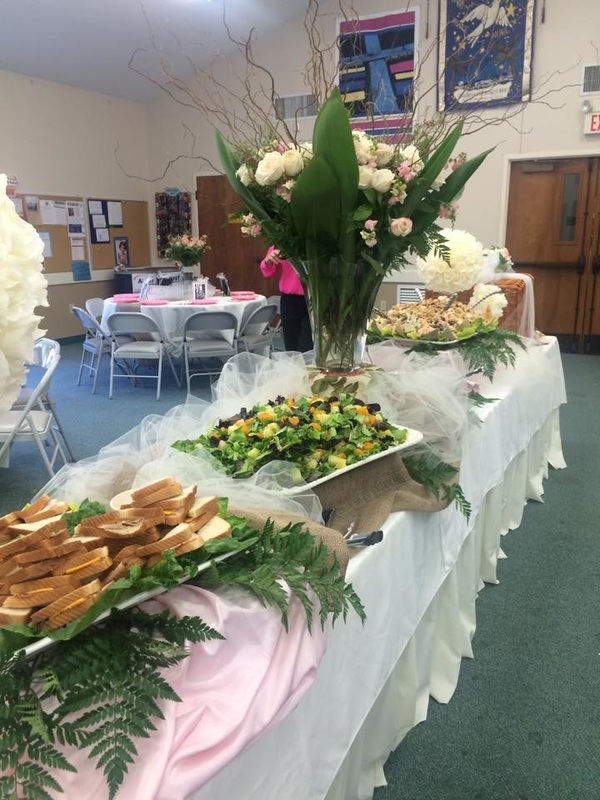 Our Mother's Day Luncheon is a special event for our "seniors" and their mommies! 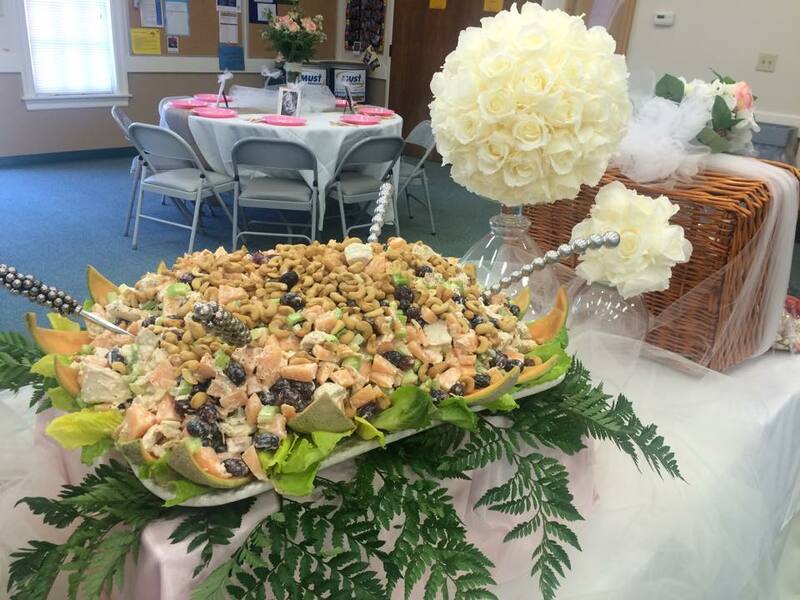 Before enjoying chicken salad, croissants, sandwiches and salad our students get to surprise their mommies with a special performance. The Mother's Day Luncheon is a great opportunity to give your little ones some extra love before they head off to Kindergarten. Between the performance, flowers and delicious lunch Mother's Day Luncheon is one of our events. 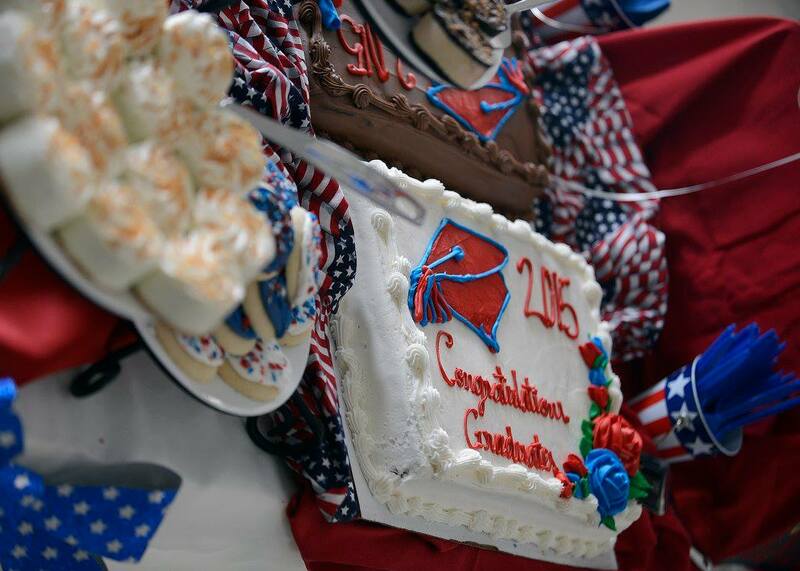 What celebration is complete without cake? 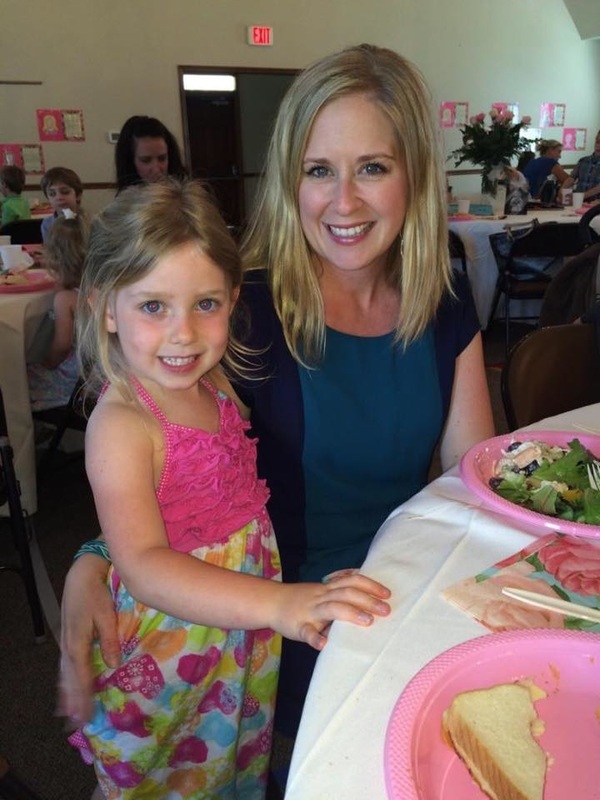 Mom and Daughter enjoying each other's company during the Mother's Day Luncheon! 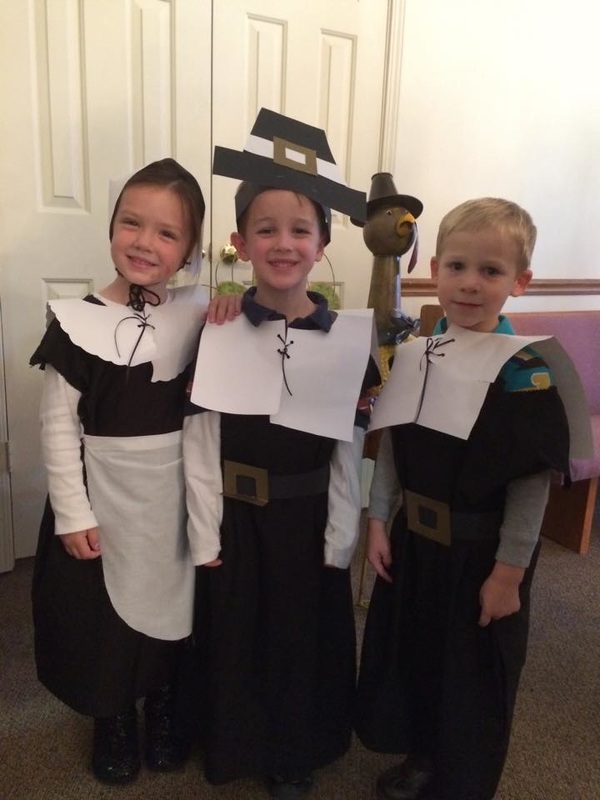 What a beautiful pair! 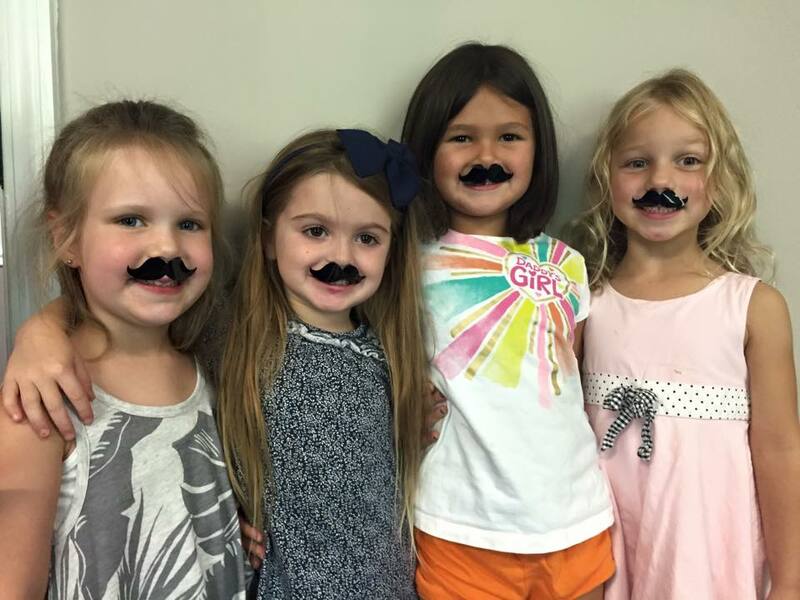 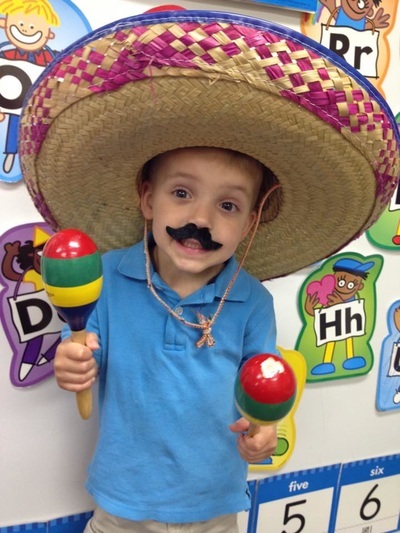 During our Cinco de Mayo theme our students get to dress up and have a ball! 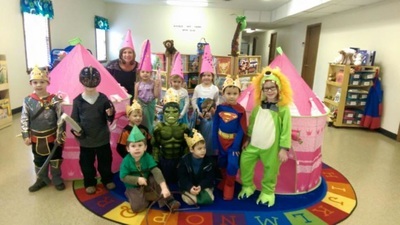 Character Day was a big hit during our Fairy Tales and Fables theme. Who is your favorite character? 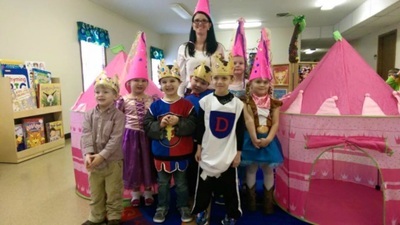 These Princes and Princesses enjoyed a fun day learning about Fairy Tales and Fables! Graduation Day has come. It's hard to believe these kids are headed to Kindergarten! 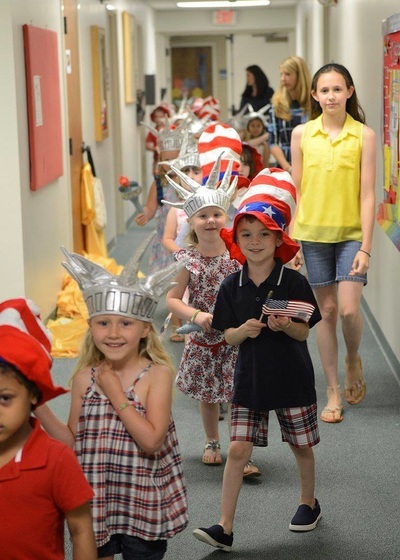 After years of learning and growing before our eyes, it's time for our students to perform our Patriotic Graduation! 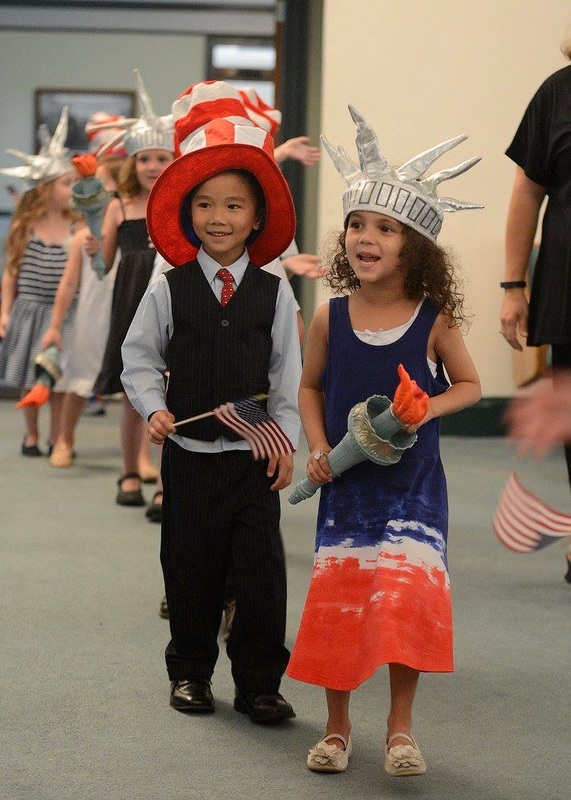 Uncle Sam and Lady Liberty are on their way to the stage! 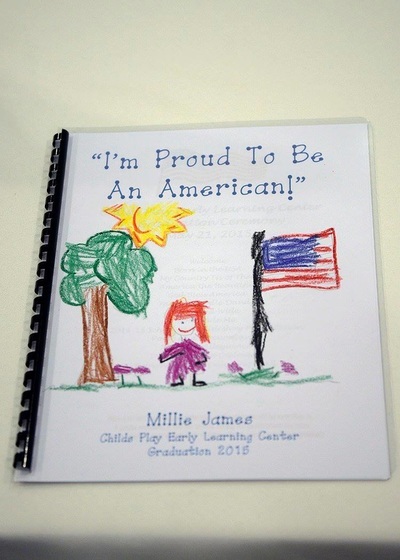 Get ready for one patriotic send off from Child's Play! 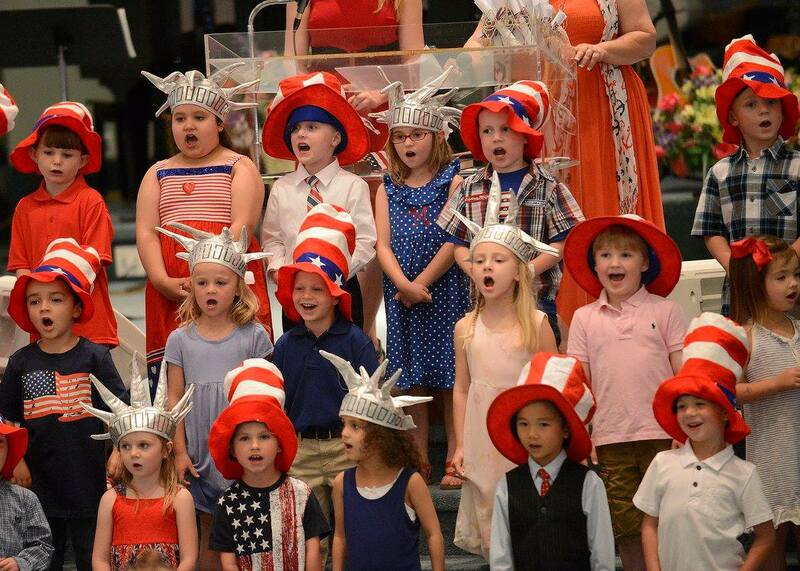 America the Beautiful sounds even better being sung by these sweet voices! 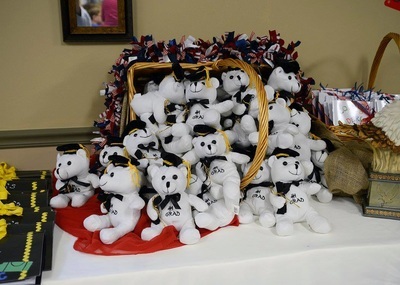 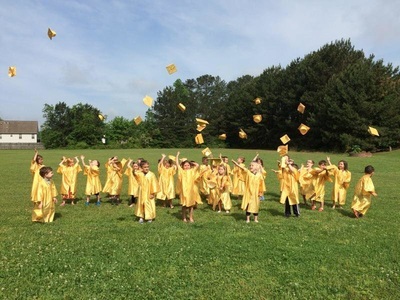 Reminiscing on a wonderful experience at Child's Play after the Graduation program has ended. 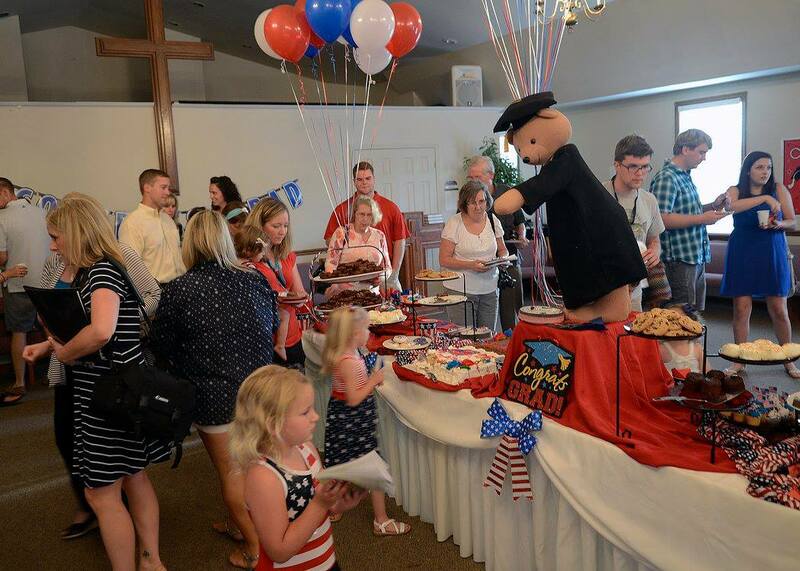 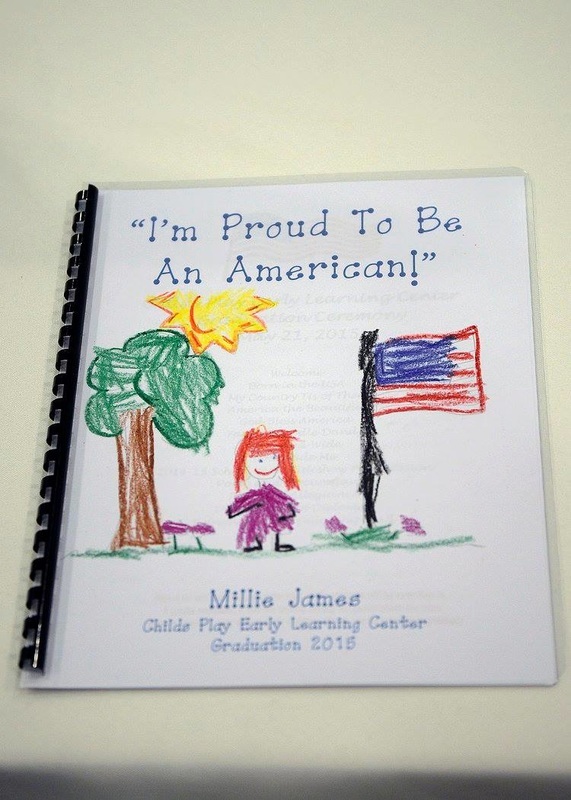 Child's Play Graduation Programs are full of our students thoughts and opinions on "patriotic subjects." 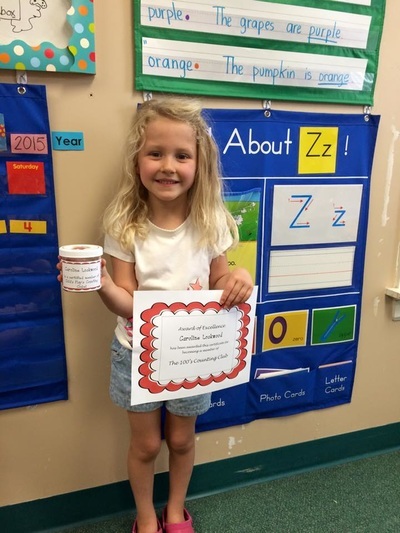 The most pressing issue, "Who was George Washington?" 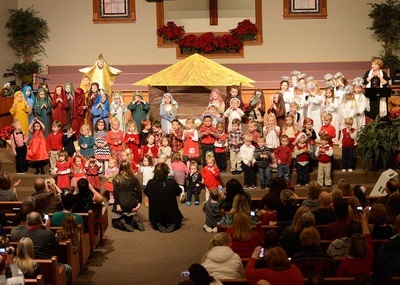 The children's responses are priceless! 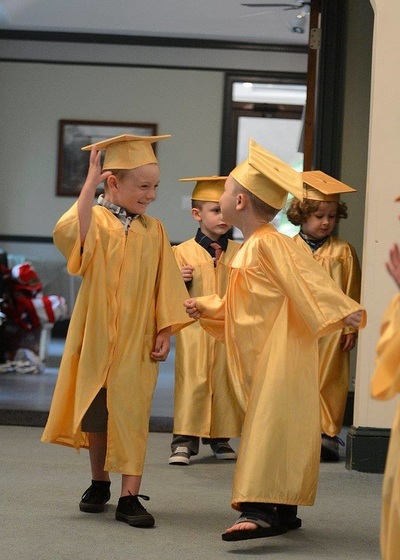 "We did it, man! 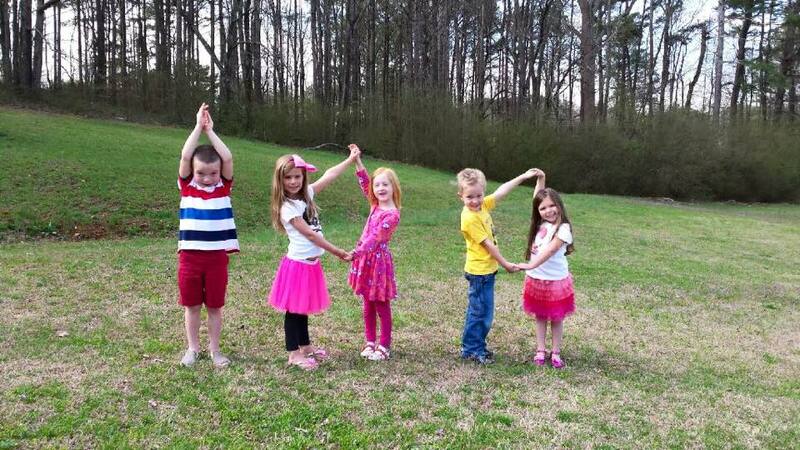 High Five!" 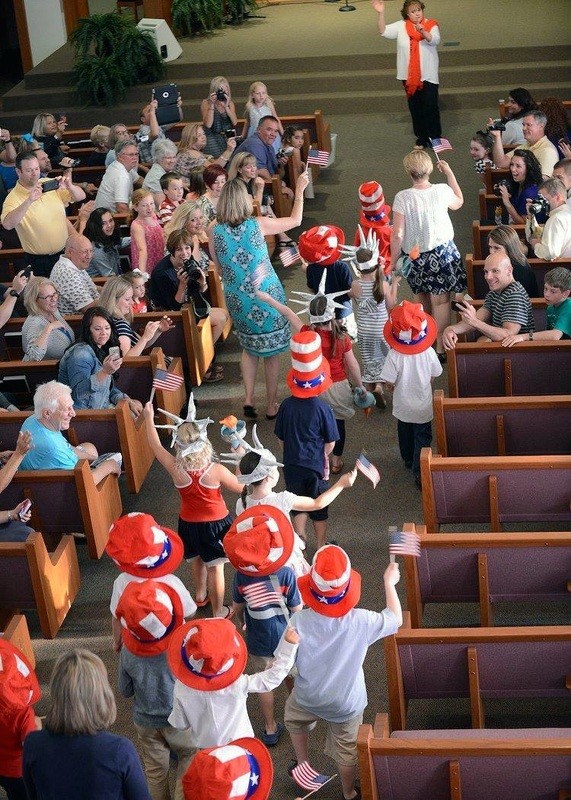 Hats off to these well-prepared graduates!